This simple Woven Paper Jack-O'-Lantern paper craft is a great project for an afternoon at home with the kids! You don't need anything other than construction or scrapbook paper, scissors, and glue. You'll also be working on developing fine motor skills and will have a cute little Halloween pumpkin when you're done. Or, you can leave off the jack-o'-lantern face and use it as a fall craft. 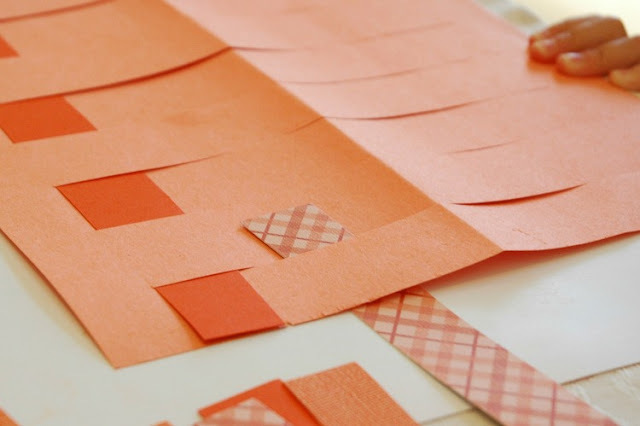 Cut some orange scrapbook paper of various patterns into strips, the same length as your construction paper. Fold your construction paper lengthwise. 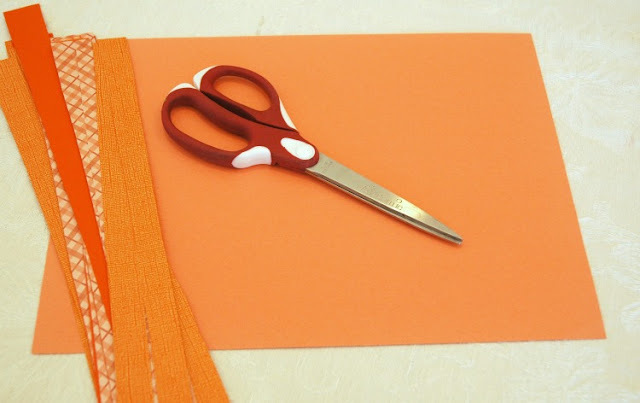 Cut the paper, beginning at the fold, about every 1/2 to 1 inch (depending on the age of your child). Cut towards the edge, but stop about 1 inch before you reach it. 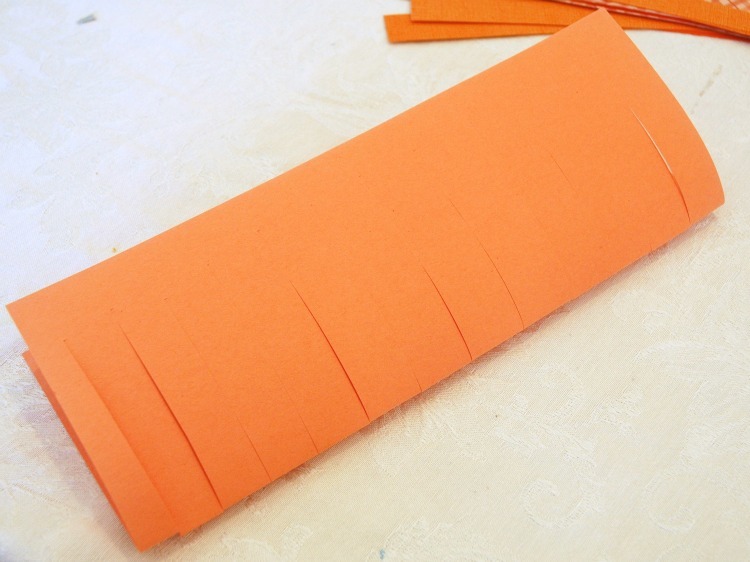 Unfold the construction paper. 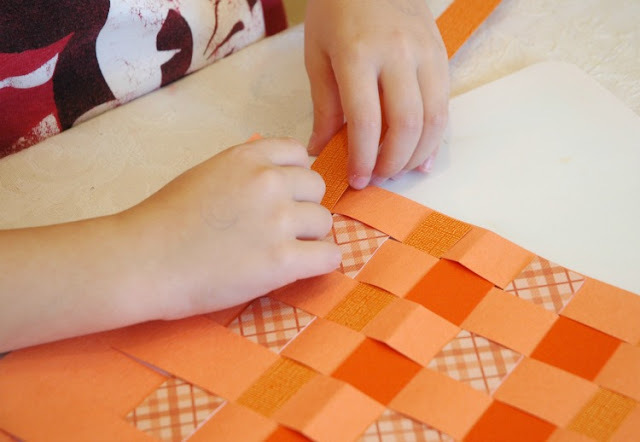 Begin a basic weaving pattern. Over, under, over under. Push each strip up to the top as you finish it. 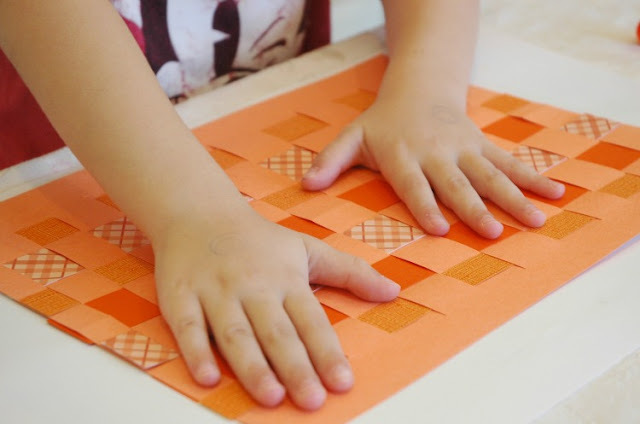 This project is so great for fine motor skills. It also works on improving focus and concentration. Lena kept saying the pattern aloud, "Over, under, over, under." 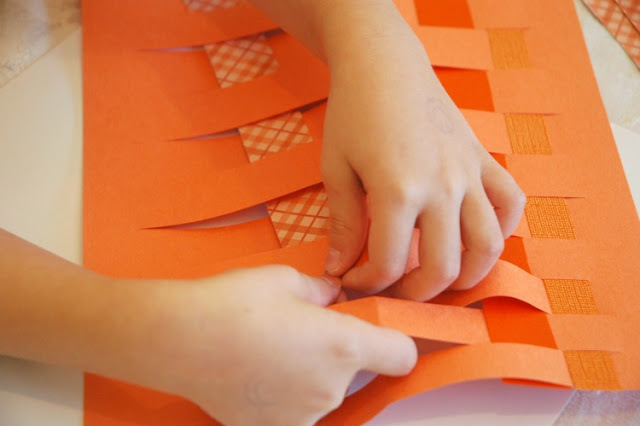 Continue weaving until you've completed the whole paper! Maggie actually participated in a craft with us! She's been on a bit of a craft strike lately! I cut her strips wider than Lena's, and she was able to do a few rows, but did need quite a bit of help. The last row is tricky. You may need to help, since there's not much room to maneuver the strip. 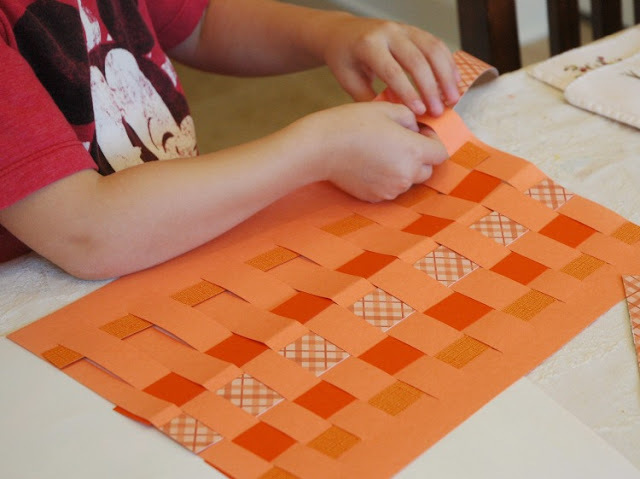 Once you've finished the weaving, glue the whole thing to a piece of cardstock. 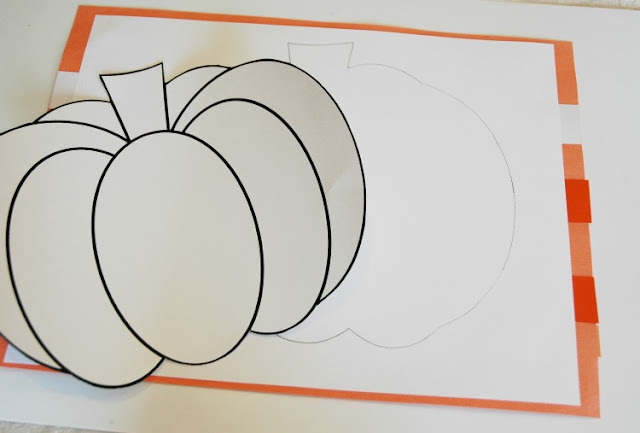 When the glue has dried, trace a pumpkin shape on the back of the cardstock. I printed and then cut out the "Large Pumpkin" on this page from First Palette. 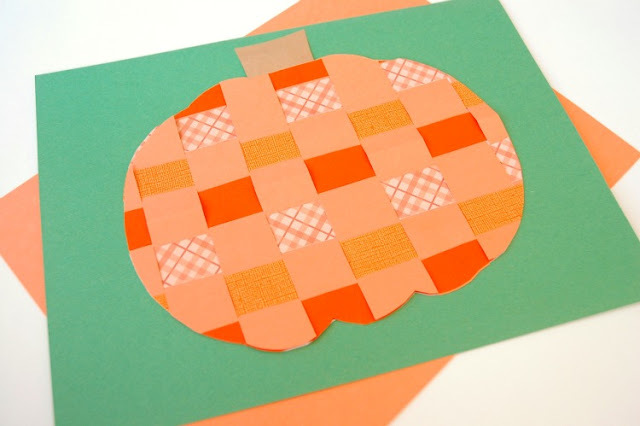 Cut out the pumpkin shape and glue it to a piece of paper. Lena wanted to add a small brown construction paper stem. 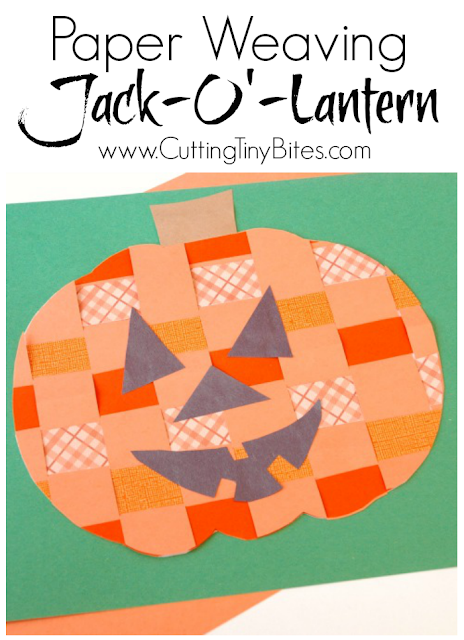 Leave your pumpkin plain if you'd like, or you can add black construction paper pieces to make a jack-o'-lantern face. 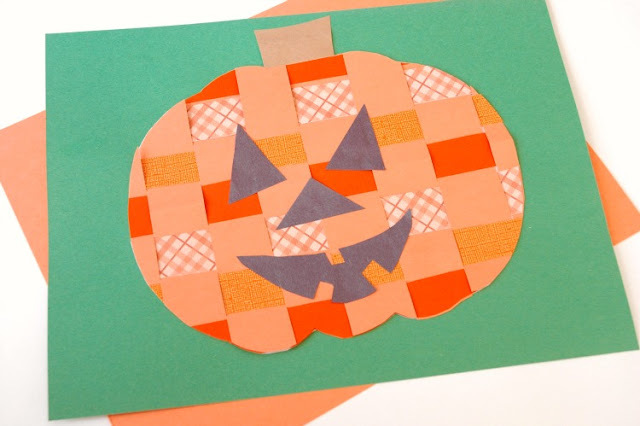 For more great Halloween ideas, check out the What Can We Do With Paper And Glue Pinterest board below! 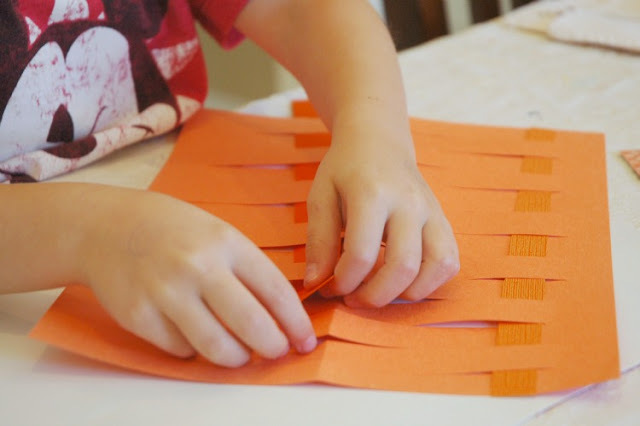 Easy fall or Halloween craft for kids. 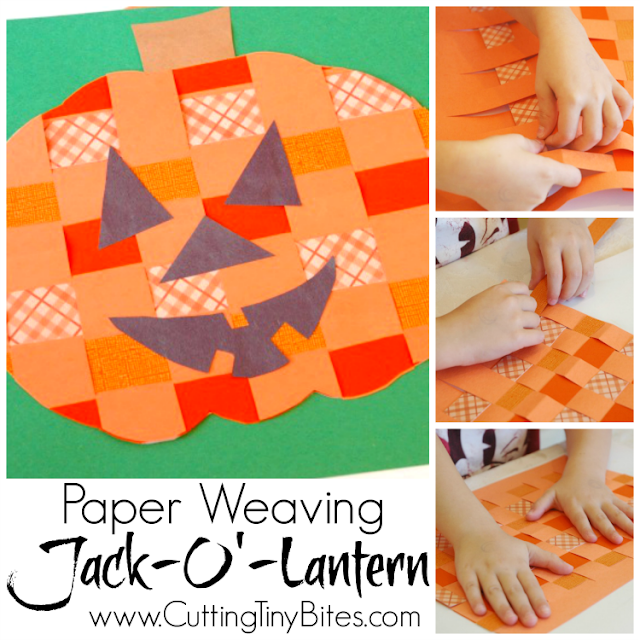 Paper weaving pumpkin or jack-o'-lantern. 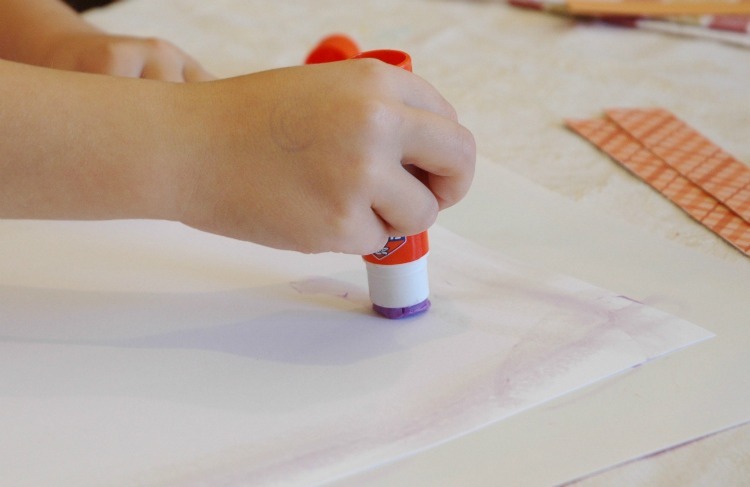 Great fine motor work for preschool, kindergarten, or elementary!